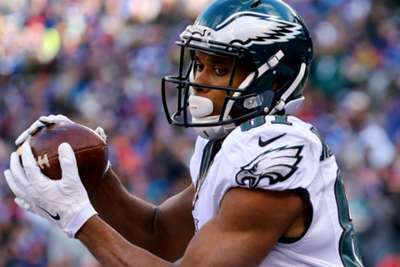 Jordan Matthews is back with the Philadelphia Eagles after the reigning Super Bowl champions re-signed the wide receiver. The Eagles also confirmed they had placed starter Mike Wallace on injured reserve. Philadelphia have been left with just three healthy wide receivers on their roster after injuries to Wallace, Alshon Jeffery and Mack Hollins, though the team has reason to be optimistic with the return of quarterback Carson Wentz looming. Matthews was selected by the Eagles in the second round of the 2014 NFL Draft but was traded to the Buffalo Bills in 2017. He then signed a one-year deal with the New England Patriots in April but was released in August with an injury settlement after hurting his hamstring. Matthews, 26, averaged 75 catches, 891 yards and six touchdowns per season over his three years in Philadelphia.